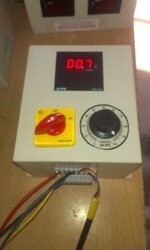 Owing to our wide expertise, we are successfully involved in manufacturing, exporting and supplying Torque Controller. These drives are widely used for torque driven applications in various industries, owing to their high accuracy and compact design. Our offered products are manufactured by using superior grade raw materials with the use of latest technology as per current industrial standards. We provide these drives in various specifications as per customers' diverse needs. Owing to our wide expertise, we are successfully involved in manufacturing, exporting and supplying ACPL Torque Motor Controller. These drives are widely used for torque driven applications in various industries, owing to their high accuracy and compact design. Our offered products are manufactured by using superior grade raw materials with the use of latest technology as per current industrial standards. We provide these drives in various specifications as per customers' diverse needs.